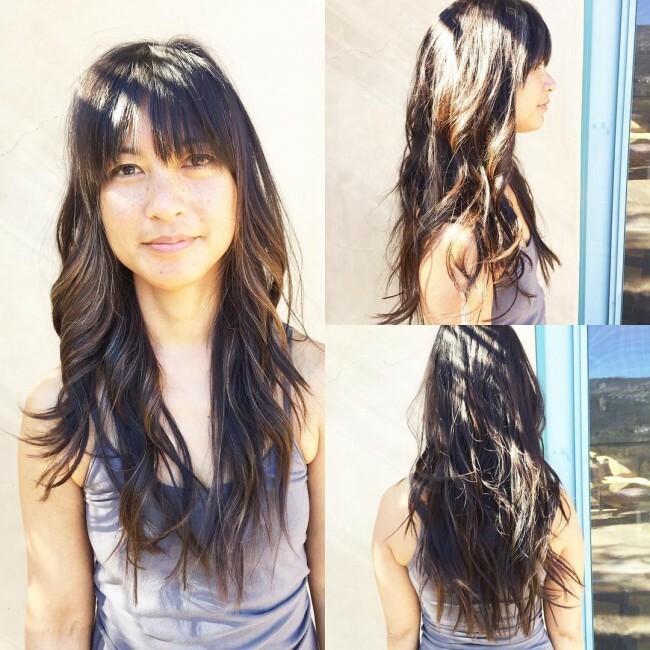 Long bangs come in all shapes and lengths, and you can also style them in many ways that range from side sweeping to blunt designs. The versatility of this style is what makes them attractive, and the fact that you can use them as your primary design or to enhance a different headdress also makes them worth trying. 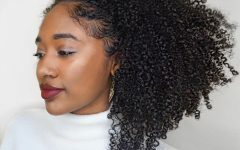 The 50 styles below are a few examples of the common ways you can wear long bangs, and you can try a few of them out or use them as inspiration to create a different style. The texture of these brunette locks is magnificent and although this helps to create a lovely style it would not look this good without the smooth ombre bangs. 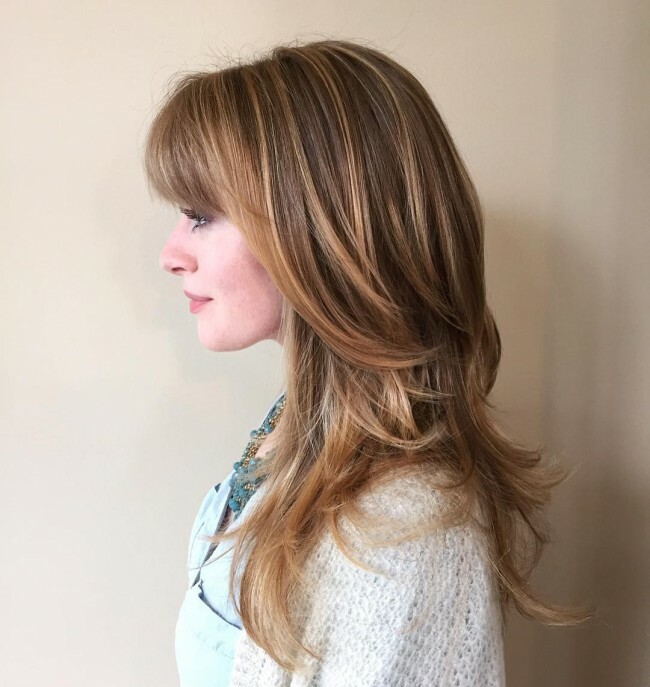 This ombre design involves transitioning from a light brown base to blonde, and this gives the hair a perfect color. The lovely color pattern also helps to enhance the nicely chopped smooth bangs. Layering your locks can aid in concealing their thinness as it gives them an extra volume. 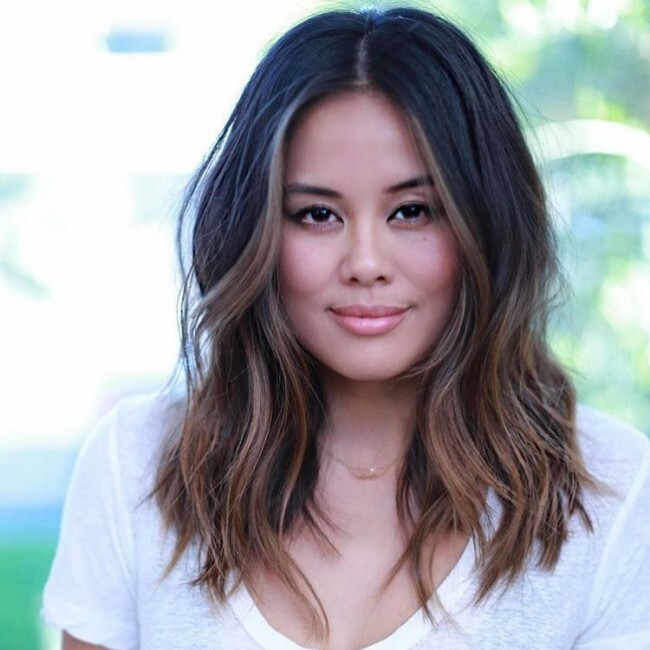 If you have some lovely colors on your strands and a decent cut like this long bob, then you will look more outstanding. The center part and the smooth side sweep style are also important in the style as they help to expose the contrast created by the darkened base. Beach waves provide a perfect summer look, but they can also work as an everyday look if you trim them well and have a charming color. The beach waves on this style have a beautiful trim and tone but what makes them distinct is the thin and straight short fringe that flows over the forehead. Blonde locks look good, but this one is way much more beautiful than the others. One of the things that make it cute is the golden hint on the locks and darkened roots. However, what sets it apart from the rest is the asymmetrical cut that looks fabulous when you brush the hair to the sides. 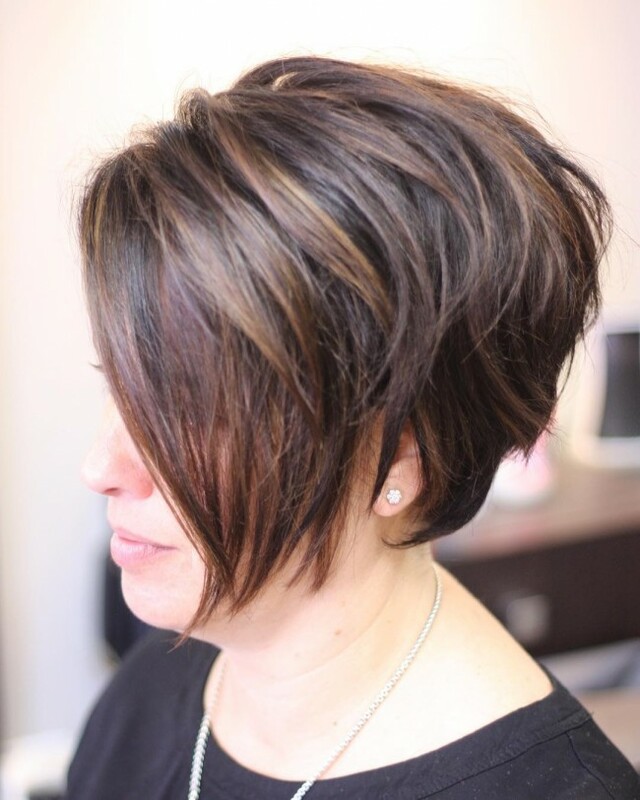 The strands in this design have a very inventive haircut that gives them a nice texture and an almost asymmetrical look. With such a lovely cut you only have to brush your hair to the back or side sweep it like in this style if you want a fancy look. However, this one takes things a little further with a cute blonde and light brown color melt. Every inch of this bob cut is perfect, and its appearance is made to look more attractive than the others by the lovely center part and smooth side sweep. The fringe at the front that flows in the same direction with the rest of the hair and the platinum blonde ombre tone of the hair also add to the beauty. The volume on these wavy strands is something that any woman would wish to have on her hair. Apart from these the hair also has an amazing blonde tone but what makes it a distinct style is the arched fringe. The arched bangs and the face frame design are what makes the wearer look breathtaking and with such a lovely headdress it will be a while before you think of changing it. Black hair looks beautiful, but the shine on this one makes it way much more attractive than others. 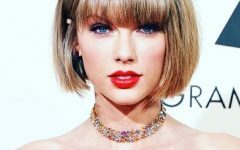 Apart from the cute bob cut in this design and the fabulous black tone, the other thing that make this an incredible design is the voluminous side bangs that hug the face and give the wearer a mysterious look. Everything about this short haircut is interesting, and it shows that you can have a perfect headdress easily if you use professional services. 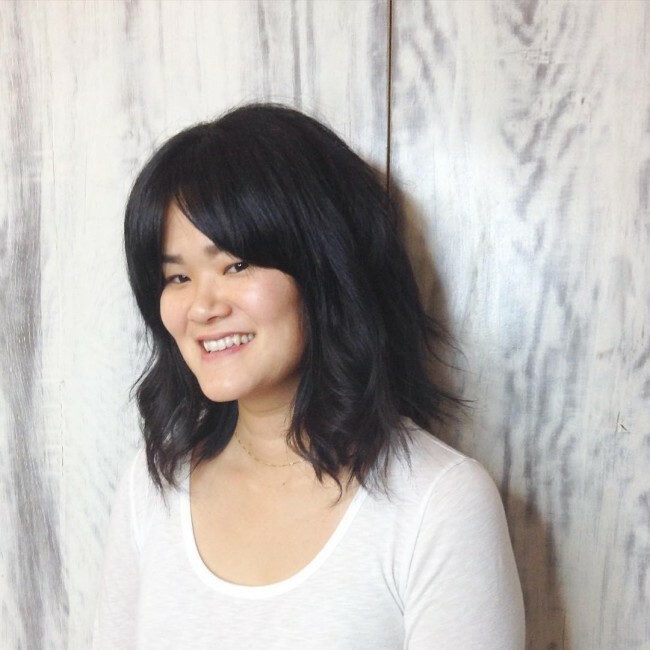 The cuts are amazing as the hair is chopped to create some sweet straight bangs that are made more detailed by their side-sweep styling that also exposes the well-shadowed roots. Vintage styles have been around for many decades, but they will never go out of trend. 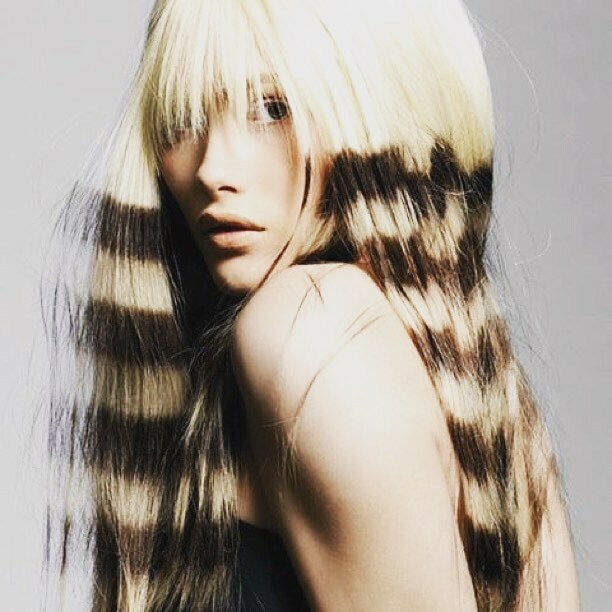 And this design proves this since it is as old school as it can get and it involves chopping the locks to create a blunt textured cut and a fringe. The headdress is then finished by brushing the strands to the sides and moisturizing them to give them a vintage shine. This headdress is effortless for ladies who have long strands with a medium volume. The only thing done on them apart from trimming them for some uniformity and texture is to push them to the sides in a messy design for a natural look. 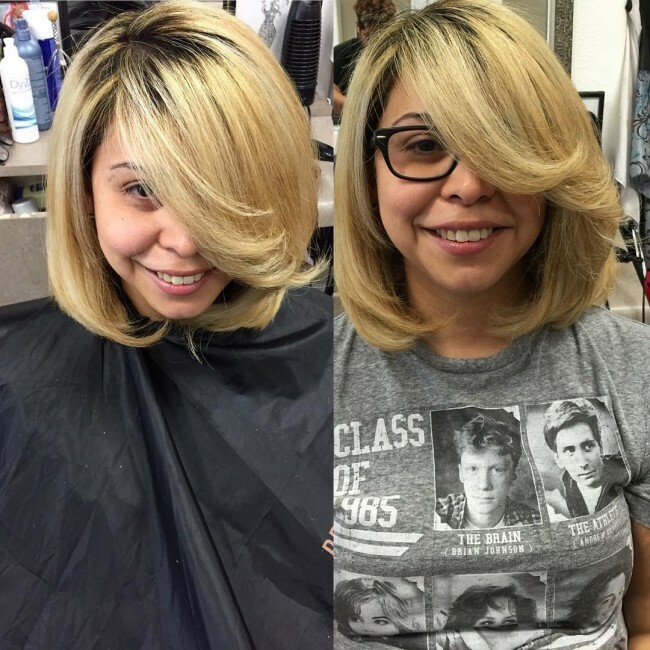 The color on this blonde bob is too light that it looks like white. And although the color is what will catch most people’s attention there is way much more to the headdress than this. The edgy bob cut and the smooth bangs that look very distinctive due to the center part also make this a top notch style. The color pattern on the lower half of these long smooth locks is very distinctive, and it imitates some animal prints and hence giving the design its wild look. However, the long straight fringe is neatly cut, and it helps to enhance the overall appearance by covering the forehead and a small portion of the eyes. A mullet comes in many shapes and sizes, but this one is unique. Unlike the others, it does not concentrate only on the longer back section. The design also has some lovely chopped bangs at the front that look even more attractive due to their purple shade. 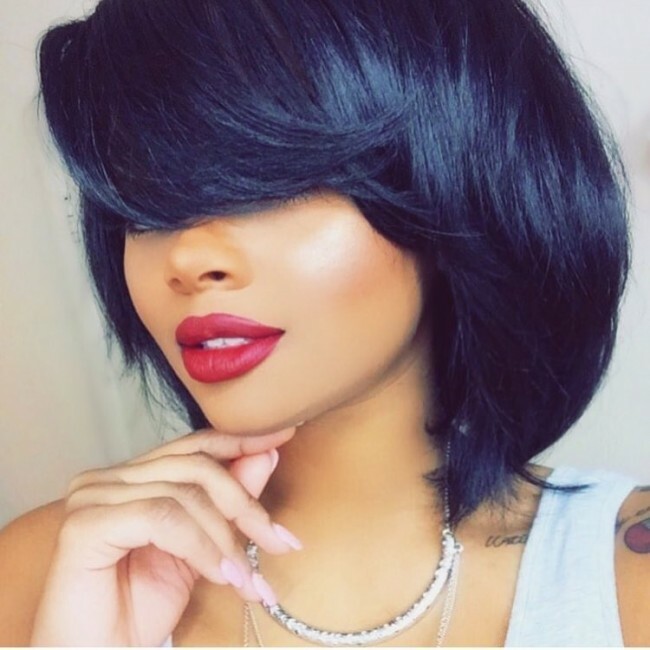 Short haircuts are adorable, and if you have some beautiful curls like this one and a black tone, then you will look fabulous. The long side bangs enhance the shiny black curls in this design, and together they create a very trendy look. Even if you have thin locks like these, you can still get an elegant headdress with some inventive colors and haircut. In this design, the thin strands have an attractive chocolate brown hue that is hand painted and a charming fringe that helps to draw attention away from the thinness of the hair. You can still have a bowl cut even with long hair if you know how to chop it. In this design, the bowl cut comes from cutting the strands into a blunt round cut at the front and then pulling the long strands into a bun at the center of the head. 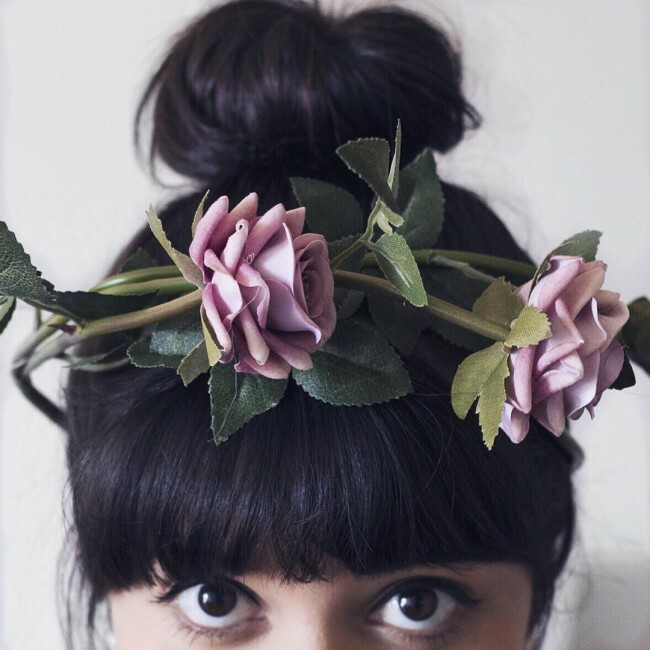 You can then accessorize with a flower headband for a beautiful finish. The Boho chic look in this design is fabulous and what makes it look this good is the haircut, color of the hair and the styling. 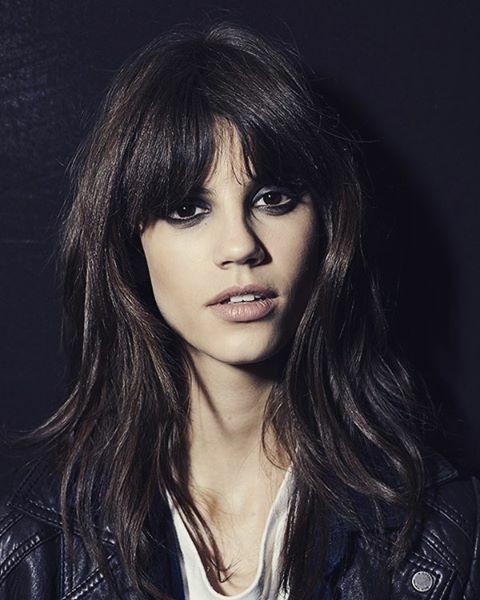 To replicate this look, you need to trim the locks shorter at the front to create the neat, smooth fringe. You should then part it on the crown and brush the short locks forward and the rest of the strands back. The color comes from a blend of different shades f brown in a sombre pattern, and so you should not have trouble replicating it. This headdress is for ladies who prefer to keep their strands very short. Although it maintains only a couple of inches of hair, the pixie cut is edgy and chopped to perfection with some attractive smooth bangs on the forehead. The light blonde shade of the design is also stunning, and it also adds to the beauty. 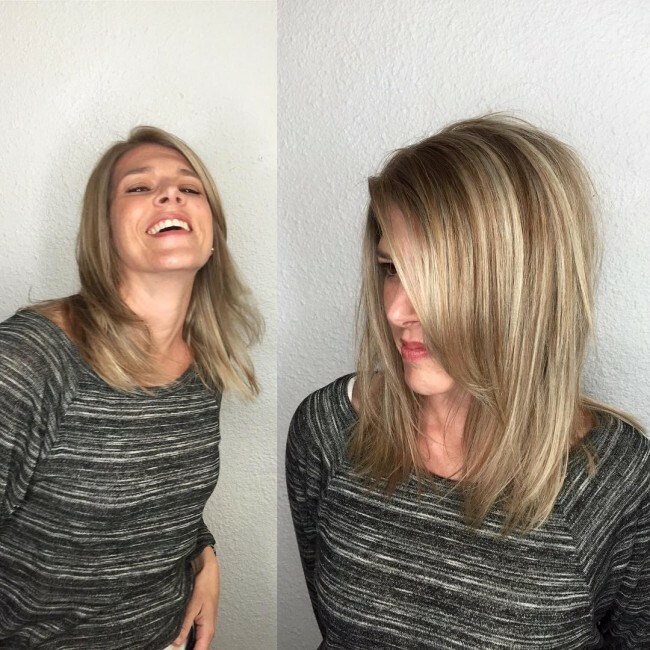 Blonde strands could not look better than this because apart from the lovely balayage ombre highlights the strands also have a magnificent cut. Although the hair does do have a perfect volume, the excellent cut, and thin fringe makes it look gorgeous especially when the hair is side swept and layered. This headdress is all about the choppy bob cut that has some moderate spikes, and it styled to create a cute messy design. The sweet chocolate shade of the hair is also lovely and helps to make the spiky mess look detailed. Apart from this the short strands also have a nice texture. Although this style looks very sophisticated, it is quite simple, and it is a creation of creative scissor trims. The trims give it the amazing texture, and they also help to create the lovely fringe. Apart from the cut the strands also have some shadowed roots that contribute to adding some contrast to the design. The choppy locks in this headdress are fabulous, and this is due to their dark tone and a nice cut. They also have a beautiful arched fringe that helps to give the style some definition and to make it look classy. For styling, the locks are brushed to the sides and layered for some additional texture and volume. 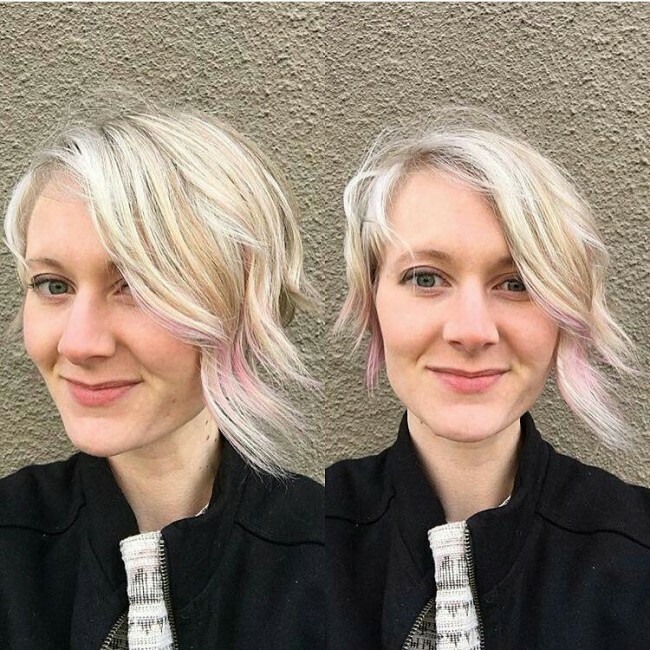 Platinum blonde makes an excellent shade and in this style, it is enhanced by the sweet hint of pink. Apart from the colors the hair also has some lovely asymmetrical bangs that are styled with a side part and by brushing them to the sides in layers. These brown and blonde color melt strands are very simple but still as refined as any other top style. The free flowing locks have a perfect texture but trimming the strands at the front to create the short bangs is what makes this headdress look elegant. And you do not even have to style the bangs in a fancy way since leaving them to flow over the forehead is enough. The locks in this design look lovely, and this is mostly due to their messy styling. However, they also have a beautiful shade with a dominant purple hue that is spiced up by subtle yellow tips and darkened roots. The bangs also have an excellent texture that comes from the scissor trim. The smoothness of this bob cut will impress any lady, and it provides an excellent example of a perfect headdress. And its edgy cut, dark tone, and the face frame design that the smooth and straight bangs create is what makes this a top notch design. And the good thing is that the style is easy to replicate if you have a short hair and medium volume. If you prefer something bright, then this is a perfect style for you. 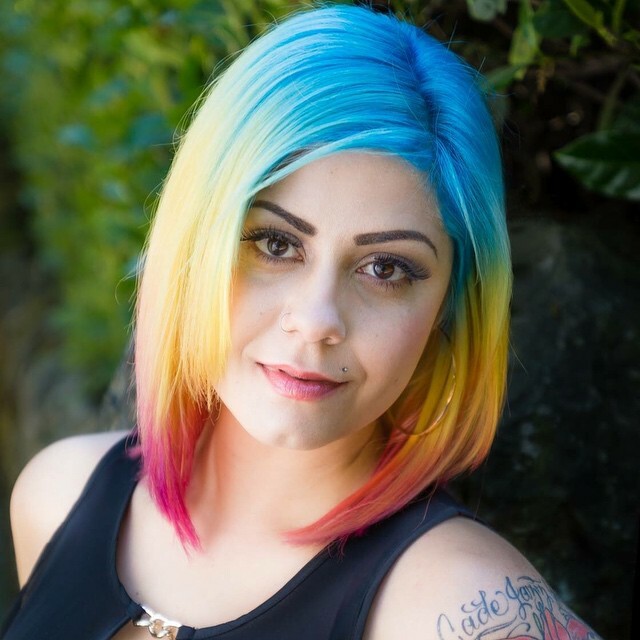 It is a hand-painted A-Line bob that involves three distinct colors that are blue, yellow and pink. The shades transition in an ombre pattern and this helps to enhance their appearance. Apart from the color the locks are chopped nicely and styled with a side part and finished by brushing the bangs into a face frame. The natural look of these long bangs is what makes them unique and they have a very moderate cut just to make the strands uniform. Their lovely styling from the center part gives the locks a nice flow and the black tone of the hair also spices the appearance. A cropped cut may be a typical and straightforward headdress, but you can make yours look distinct by making it wavy and leaving a long fringe. The design that the locks take as they flow over the face is stunning, and the blonde shade of the hair helps to spice it up. These smooth strands form a statement style that will command some attention everywhere you go. It is impossible not to notice a vibrant shiny and a thick symmetrical fringe like this one. And what makes it even more unique is that it is a versatile design that you can wear for any occasion. The blonde highlights on these dark brown strands are moderate, but they still manage to spice it up to make it look attractive. 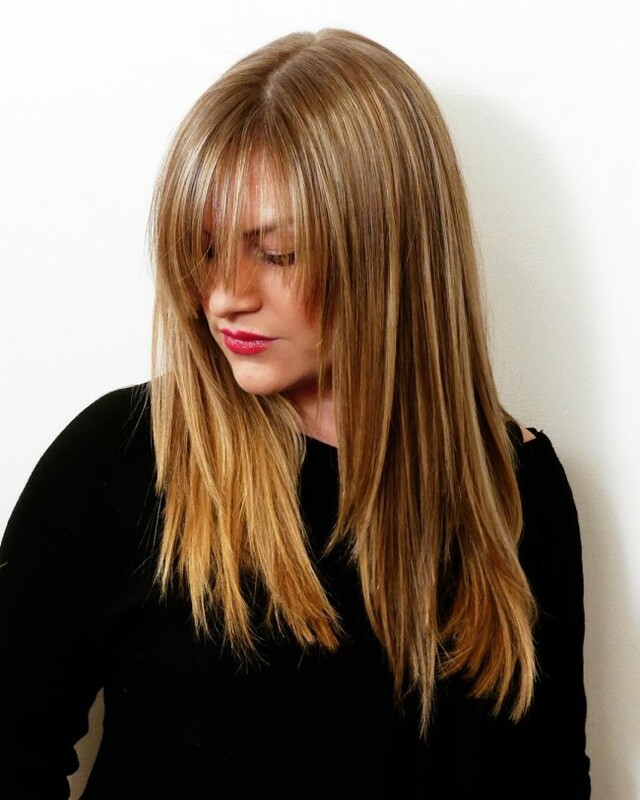 Apart from the lovely highlights the long fine locks also have a thin, simple fringe that makes them look fabulous. The angles and the edges on this short haircut are fascinating, and they help to make the headdress unique. And although it is an ordinary short bob haircut it is not easy to know this due to the angles and blunt cuts on the design and also the blue tone with a hint of pink. This headdress is very natural and it has almost no cuts at all but still looks lovely. The cute curly bangs come from growing out the hair, and their appearance is enhanced when you slightly sweep them to the sides. However, their brown tone also helps to spice up the design. If you want to breathe some life into your headdress, then you should try flipping the bangs like in this design. 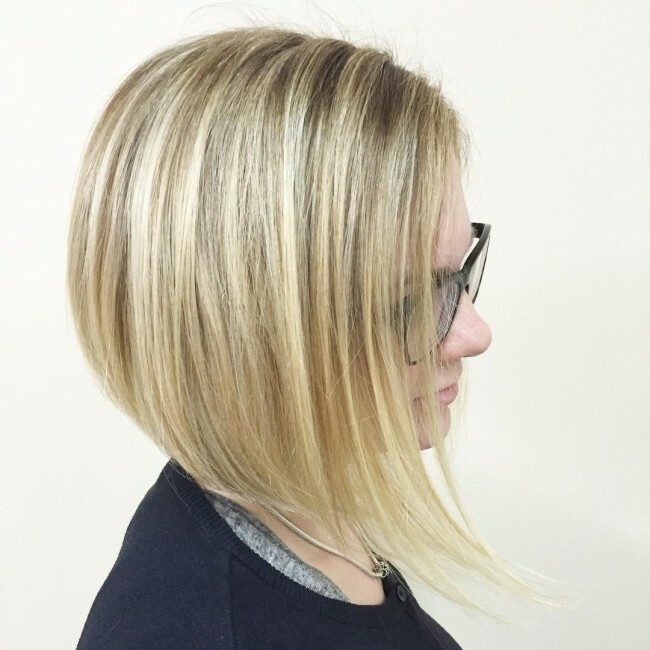 Here the long blonde locks are carefully lined with plenty of layers from the center part and the ends are slightly flipped to give them an extra definition. And with a bit of teasing for an additional volume, these blonde locks will make a woman look outstanding. There is nothing fancy about this style but its cut, and design is what makes it look very distinct. 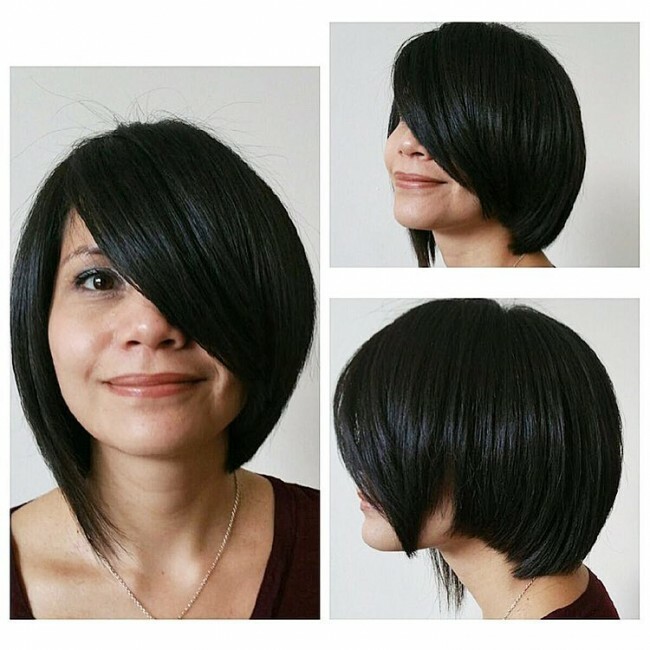 The natural black locks have an amazing tone, and they are also very smooth, but the edgy bob cut and the asymmetrical side sweep gives this design its refined look. 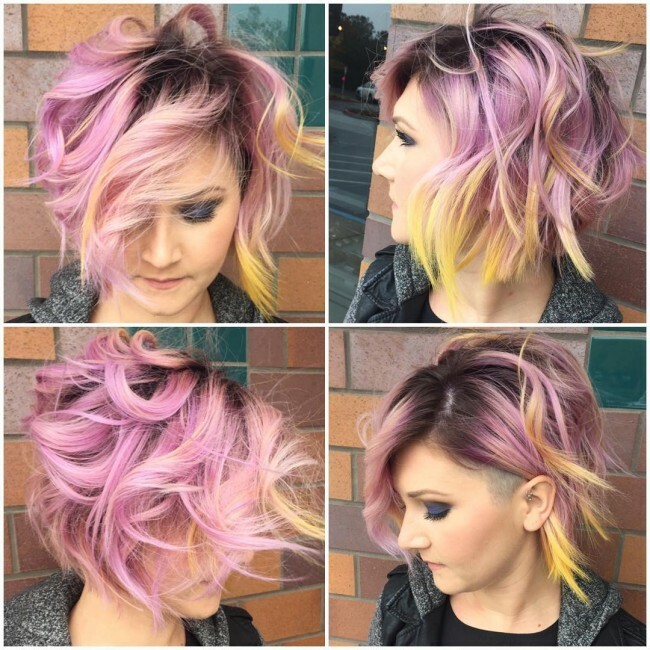 This cut is as edgy and precise as it can get and it also has a perfect dye job. 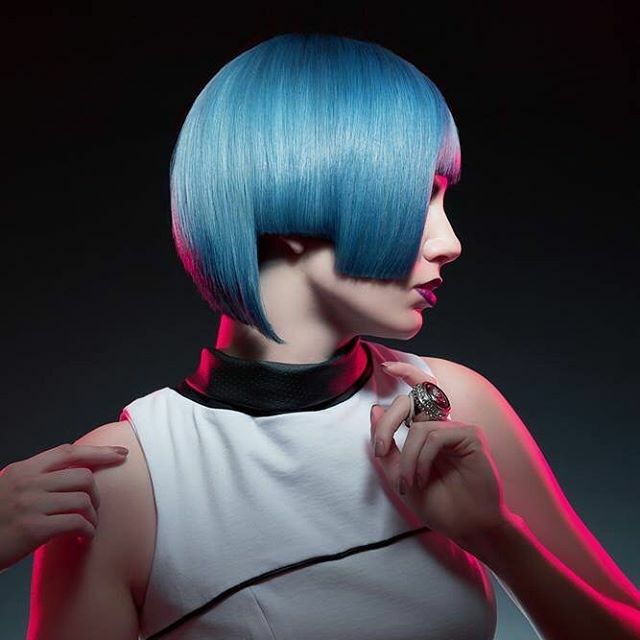 The blunt cut and the asymmetrical design at the top help to create the unique bangs that form what looks like an inventive bowl cut. Styling the locks to cover the eyes gives the style some mystery, and the hint of pink makes the look more interesting than others. Bob cuts are very attractive but this one looks much better than others, and this is because the trims are very creative, and it has some lovely light brown highlight on a chocolate base. The bangs in the design are then stacked to make the style detailed and to give it some extra volume. The color pattern in this design is stunning, but it would not look this good without the distinct long bob haircut. 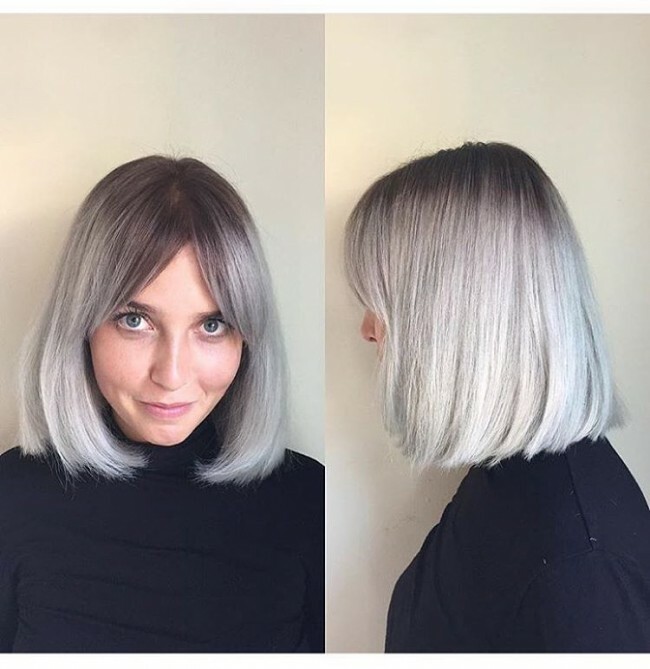 Long bob cuts are perfect for ladies who would wish to maintain some length on their headdress, but this one has some lovely texture and volume that help to make the ombre color pattern look unique. The side-swept bangs at the front of this design give it some definition and make it very stylish. 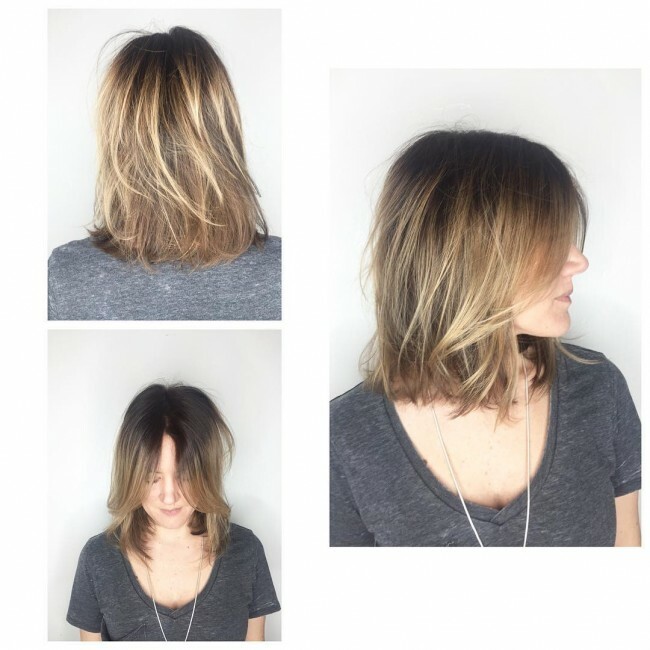 Apart from the bangs the hair also has a lovely messy style and a trendy balayage dye job that entails blending blonde and brown shades to create a perfect tone. No other color brings out a woman’s femininity better than pink. This lovely shade looks much better if you also have the right hairstyle like this one. The long, voluminous strands in the design have some moderate trims that give it texture and help to create the cute fringe at the front. And the headdress is then finished by brushing the hairs to the side to create a free flowing face frame look that accentuates the wearer’s facial features. The volume on this hair will turn heads, and it will make any woman want to replicate the headdress. Other things that make this a top notch design include the green tone, the curls and most importantly the straight blunt fringe over the forehead. 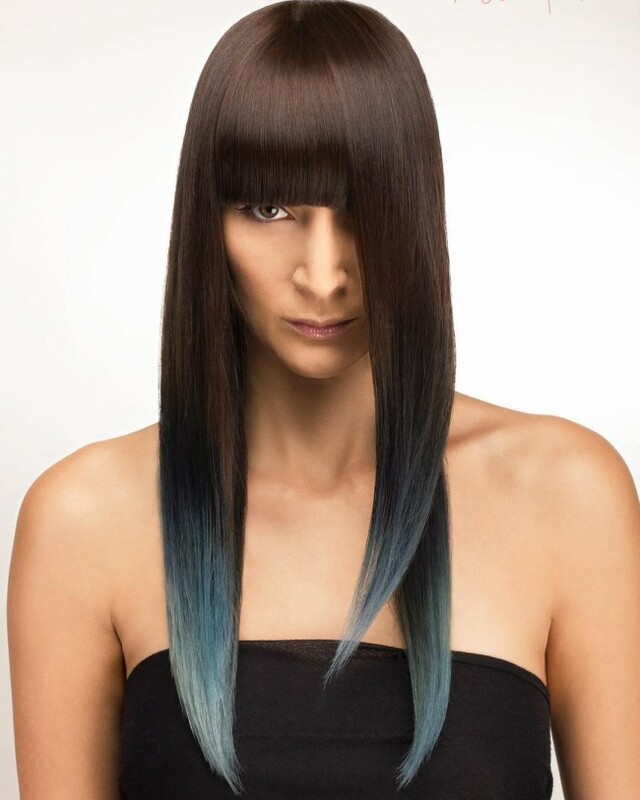 The fringe is very straightforward as it only involves chopping and straightening the strands but the green shade makes it look sophisticated. Brown makes a classic tone for your locks, but if you combine different shades, you will create a unique appearance like this one. However, the choppy haircut and the diagonal sweep of the fringe is what make this a lovely headdress. The style also helps to expose the beautifully shadowed roots in the style. Hairdos with bangs are easy to create, and you do not have to make them too complicated or fancy to look good. 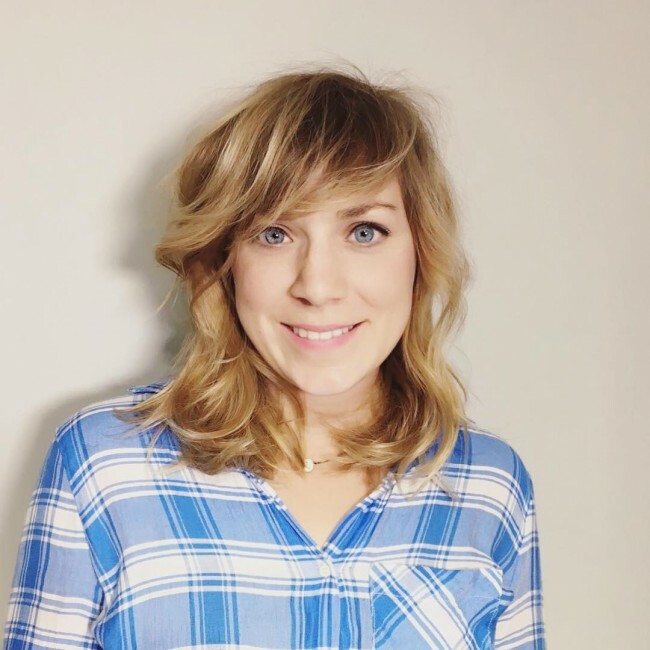 A simple design like this one that involves chopping your blonde strands into some short, sweet bangs will make any woman stand out. And if you accessorize the style with a simple headscarf like in this design you will look fabulous. 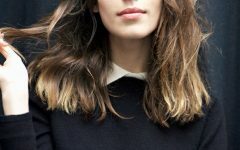 If you have a beautiful thick hair like this one, you should give it some subtle layers to add some movement and also to make it look lighter than it is. 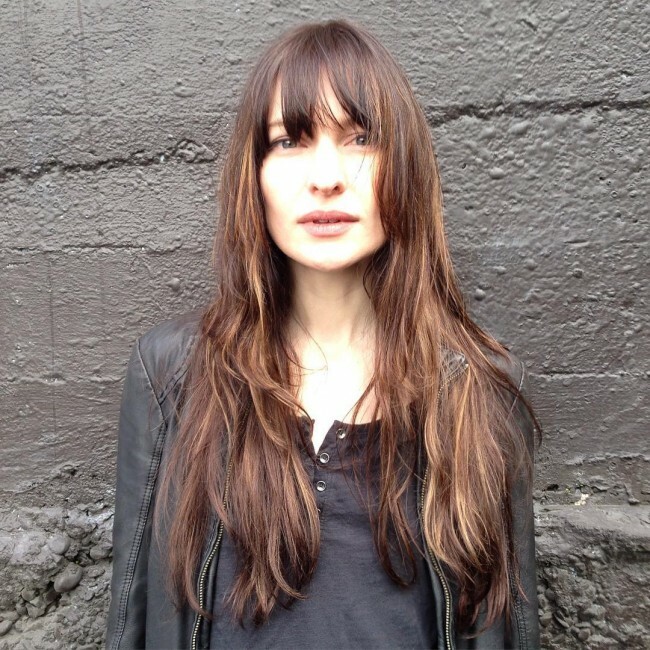 However, you cannot get beautiful layers without first trimming the locks to create some bangs because they are easy to layer. The hand painted honey tone is also important because it enhances the beauty of the headdress. Jennifer Lawrence has a cute oval face, and so she can wear almost any style and still look beautiful. 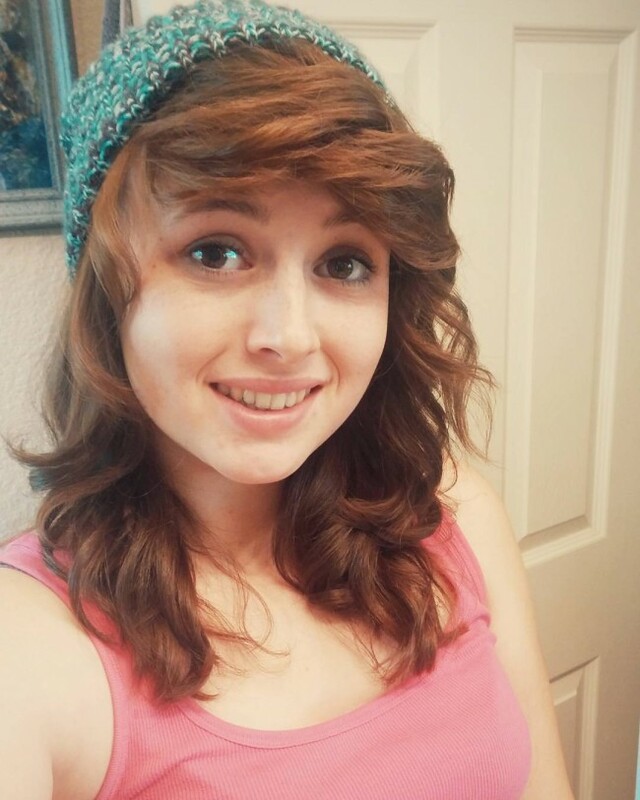 In this particular one, she goes with some sweet side bangs that have perfect cuts. And despite their simple styling they look very refined, and this is due to their brunette shade with some golden streaks. 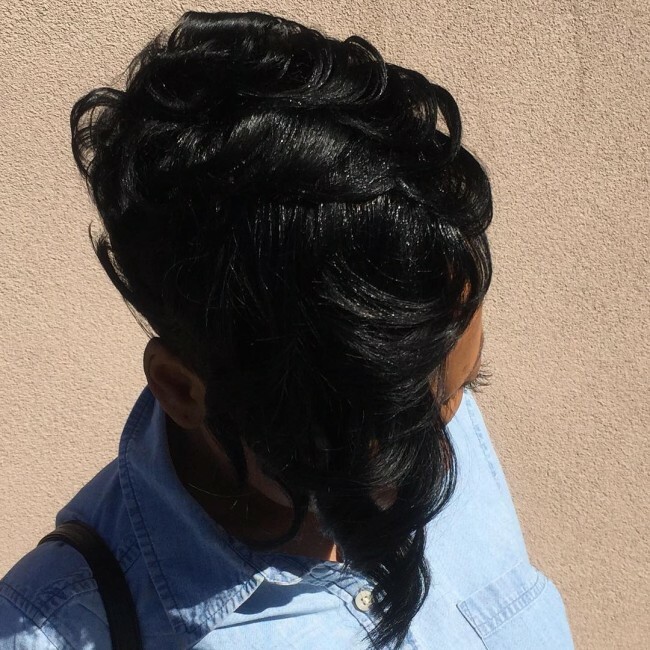 Wavy hairs will always look good on a woman provided she cuts and styles it right. And one way to do this is to chop it to a medium length like in this design and then leave a few short bangs at the front. You should then style it with a side part and by pushing the fringe to the sides. This design will look more attractive if you have a lovely tone like this chocolate brown. The shade of this headdress is amazing, and it comes from a blend of brown hues with a hint of blonde. However, the color only helps to enhance the lovely haircut and styling. The style involves chopping the strands to create the front fringe that you should then side sweep from the side part. You should finish by flipping the ends of your free-flowing locks to add a twist to the look. 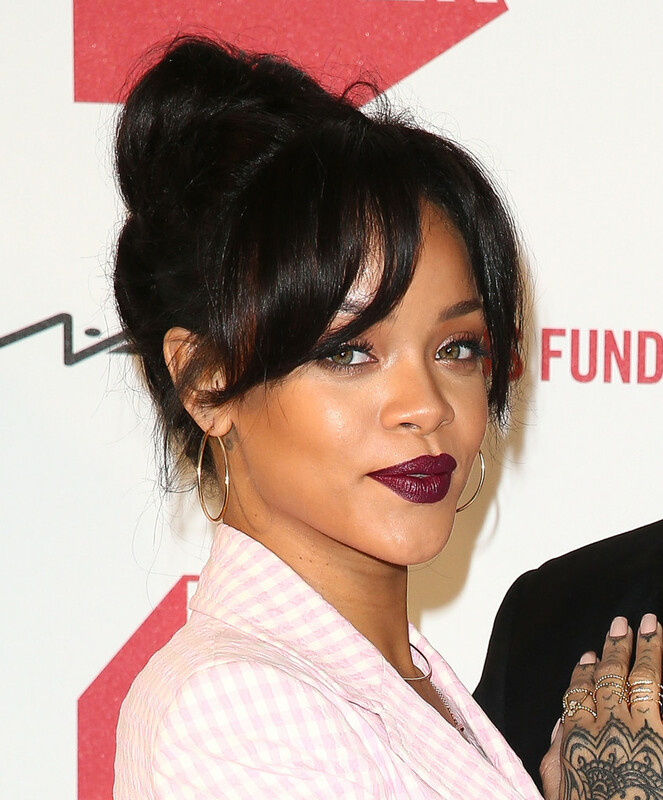 It is hard to think of any hairdo that would not look good on Rihanna because she has tried almost everything over the years. In this style, she has an updo that consists of a loose bun and fringe that is divided into two sections to create a diagonal face frame design. Although the loose bun looks great, the fringe is what makes her style unique. Sandra Bullock is one of the most talented female celebrities in the world, and she seems to extend her talents to the type of hairstyles that she likes to keep. 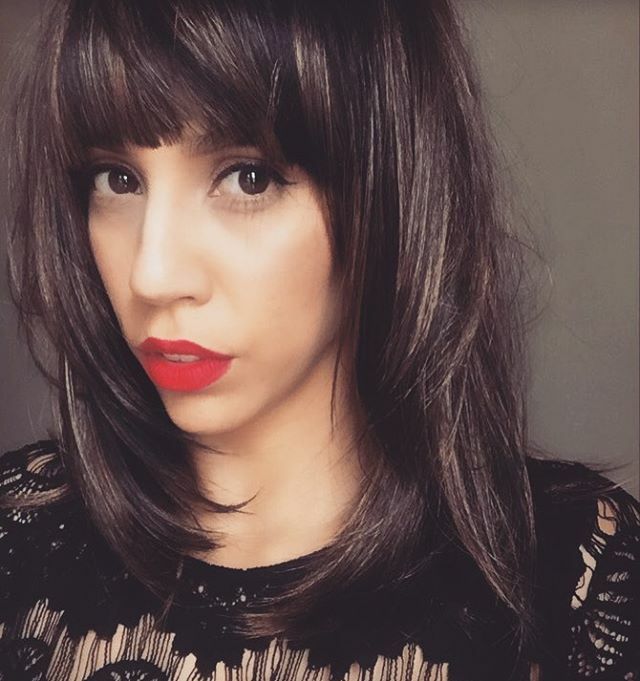 Here she has a beautiful arched fringe and long straight locks on the sides to accentuate it. Her lovely hair color also adds some beauty to the style. 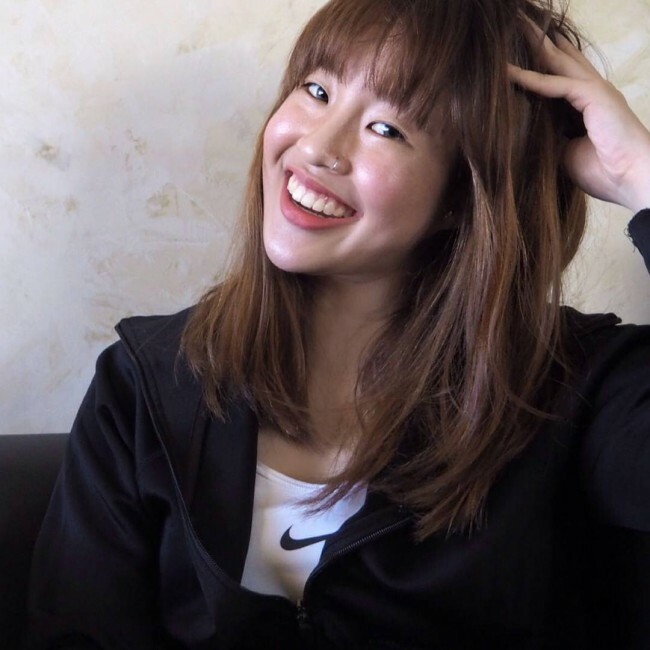 Long bangs can enhance any hairdo, and the best thing about them is that any woman can have them effortlessly as all that she requires is the right haircut. Whether you want to have the bangs as your primary headdress or part of something else there are still many ways to cut and style them. And with the above delightful styles in mind, you will have little to no trouble finding a style that works well for you.